I wasn’t prepared for lunch at Brucie. I’d been delighted by dinner at the bustling nouveau-ltalian restaurant, tucked under Court Street near Baltic, where Chef Zahra Tangorra practices an obsession with making-from-scratch and sourcing the very best in local and sustainable ingredients, from lemons to pork. There’s a vibe of updating old-fashioned Italian meals for today’s Brooklyn, so I was expecting fresh spins on classic Italian deli sandwiches. I got that, but more. I ordered the fried scallop sandwich ($13). The open-faced, towering creation featured two very large scallops, beer battered and fried. The scallops had the taste and consistency of a deep-sea white fish, surrounded by a great crunchy shell. The succulent gems sat on a few thin, crisped slices of Salumeria Biellese’s finachiona (salami with wild fennel), and a bed of pesto, and atop a slice of chewy Caputo’s Italian bread. This is a sinfully good sandwich. Every bite fills the mouth with a great degree of pleasure. Tangorra gets her fish from Gotham Seafood, choosing catches that are mostly local, sustainably-fished, chemical-free and wild-caught. The diver scallops fried for the lunch sandwich hail from Rhode Island. My dining companion ordered the special hero of the day–juicy, stringy pork topped with a sweet-pepper sort of relish. The sandwich was light and airy. The flavor sensations demanded white wine. The little one had handmade pasta with butter and parmesan. She watched a man make the pasta in front of us, as we sat on a bar overlooking the pasta-making station. We also tasted the Panelle sandwich, with chickpea fritters, housemade ricotta, honey and vinegar peppers. We followed our great indulgence with a red velvet Coolhaus ice cream sandwich. It was a relaxed, romantic afternoon. We did not eat dinner that night. We did not need to. And we didn’t stop thinking about those sandwiches for days. Lunch around Carroll Gardens and Cobble Hill is difficult for many restaurants. Many places, including Brucie and Watty and Meg, are slammed weekend nights, but disastrously slow at lunch. Perhaps we should invert our thinking. Instead of getting a sitter and going out at night, try the restaurants at lunch, when the food is cheaper and the dining rooms less crowded. Brucie is closed Sundays and Mondays. It serves lunch from noon to 3:30, and re-opens for dinner at 5. 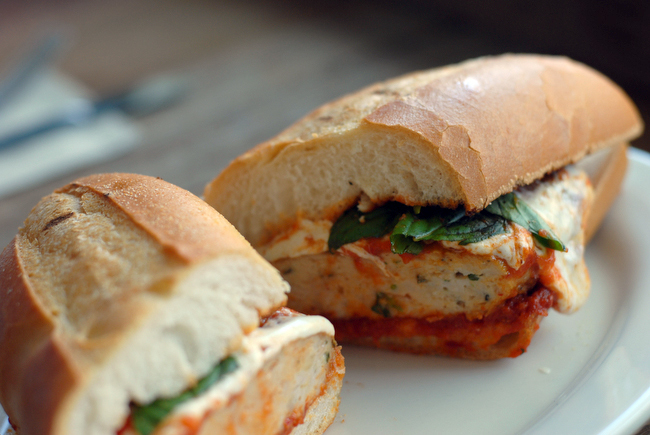 The lunch and dinner menu changes daily, but always features a chicken sausage or chicken parm hero, a meatball hero and panelle (chickpea fritter) sandwich. 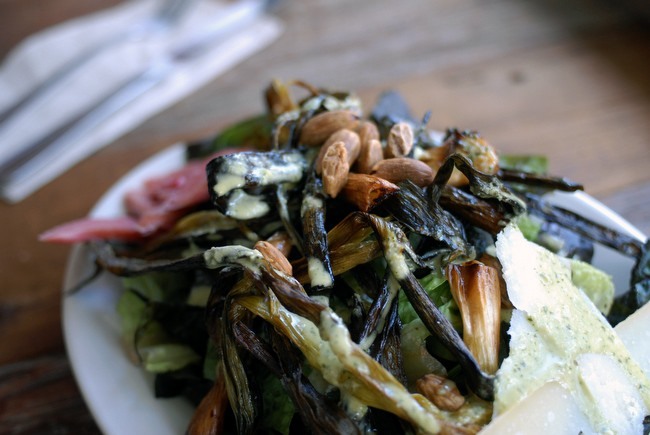 The daily market Caesar salad offers seasonal vegetables, nuts and sometimes house-pickled items, and always features Tangorra’s signature style for charring vegetables. 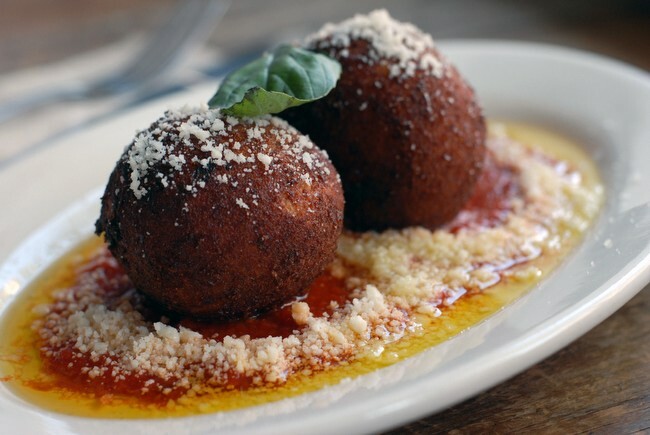 Tangorra is talented, and her lunch is Brooklyn’s answer to Torrisi’s on Mulberry Street, a popular and critically acclaimed high-concept restaurant-in-a-grocery-store. At Brucie you can purchase the best dried pastas, salamis and cheeses, milk and farm veggies, and olives in the shop’s little market. Brucie also sells prepared foods–soups, pasta sauces and other items. Recently the New York Times promoted Brucie’s lasagna program, in which you bring in your own large lasagna dish and pick up the dish the following day, filled with lasagna ready to heat and serve 12.